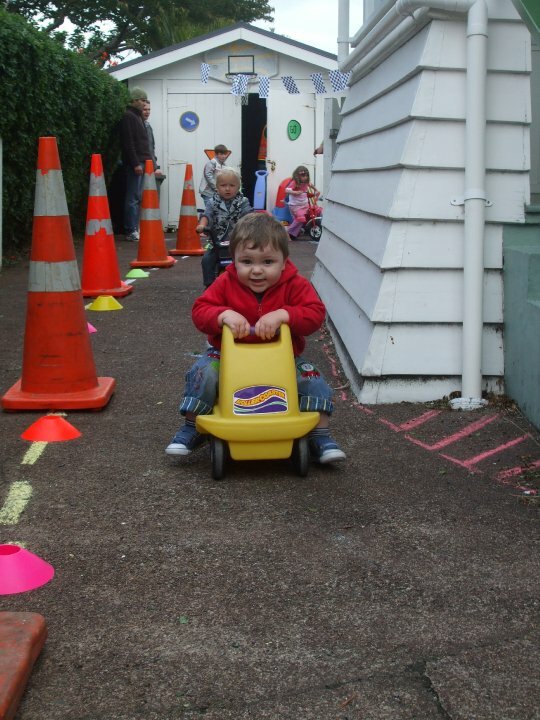 Add multiple ride-ons, a sprinkling of bunting and some energetic pre-schoolers. Mix well. 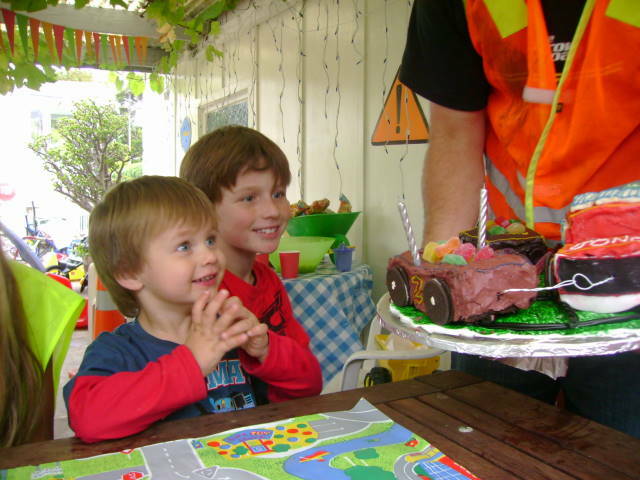 Top off with birthday cake and send them home before all hell breaks loose. Enjoy! Scrag's Whacky Wheels party is over. We collapsed on the couch when we'd finally packed the kids off to bed and cleaned up the worst of the debris, too tired to even make a cuppa - but happy tired. 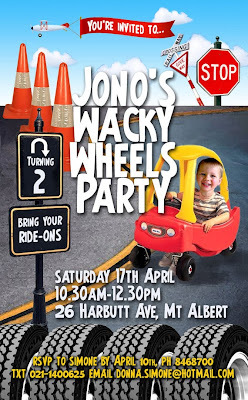 The little man and his friends had a great time, nobody came to blows over choo choo trains and we avoided any outbreaks of road rage (although there were a few tears over whose bike was whose - but only at the end). 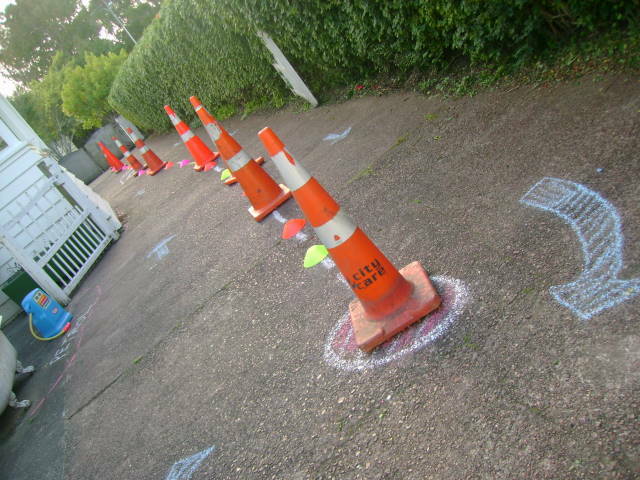 Using chalk and traffic cones (legally obtained!!) 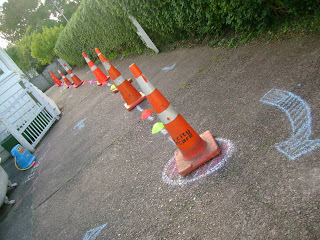 I marked out a race-track/road down our driveway. 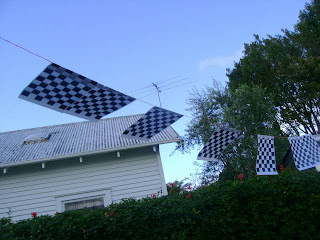 We hung up the cheats bunting over the table and a string of checkered flags across the driveway (so easy; click here). I also made some "road signs" out of coloured card and electrical tape. 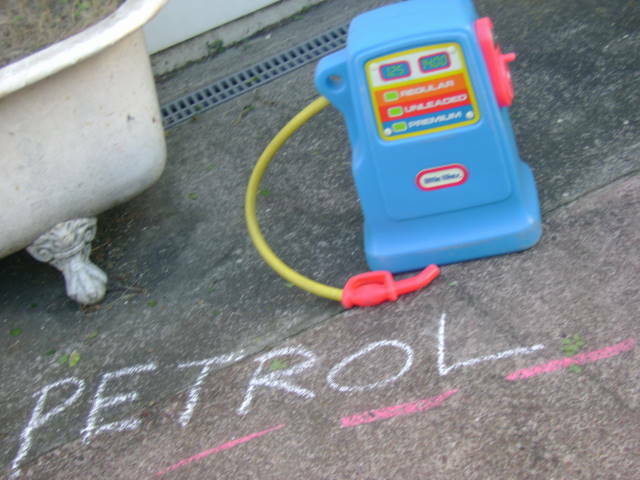 There was a toy petrol pump. And a toy cash register. And a series of minimum-wage petrol pump attendants (we paid them in cake). 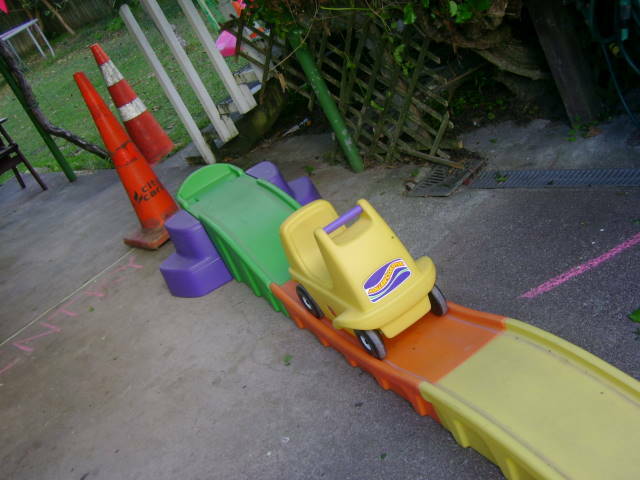 There was a slide, the sandpit, swings, trampoline and Scrag's giant toy car ramp. But I didn't get many pictures of those. The action was all on the road. But I didn't get many pictures of that either. I was shooting video. And running around being a mother. Eeeeeh! But it was great fun. When the noise rose to a crescendo we brought out the food. 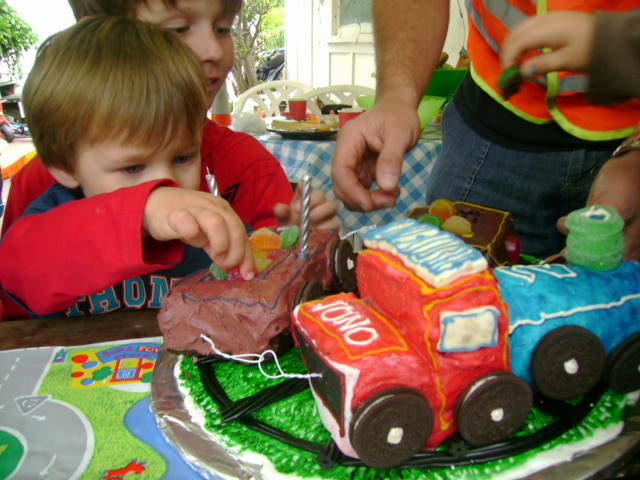 ...and my Choo Choo Train Cake. It aint perfect but the Birthday Boy loved it. This little burglar kept stealing the wheels!! Darn it, he's so tall there was nowhere out of his reach I could stash it! 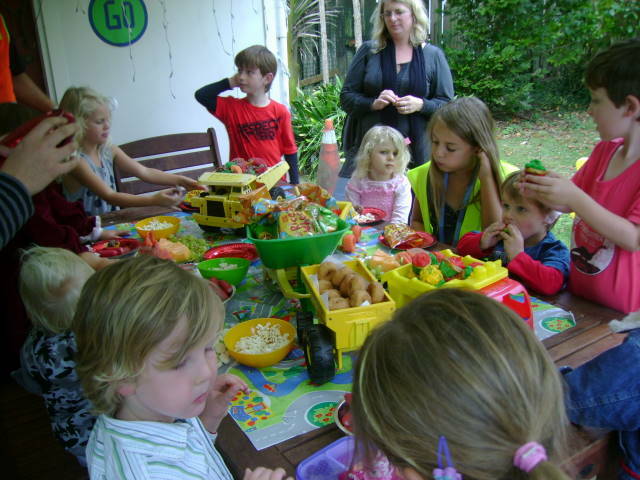 The party kicked off at 3pm; the kids were ready to eat at 3.45 (you could tell by the amount of wailing errupting in various corners). 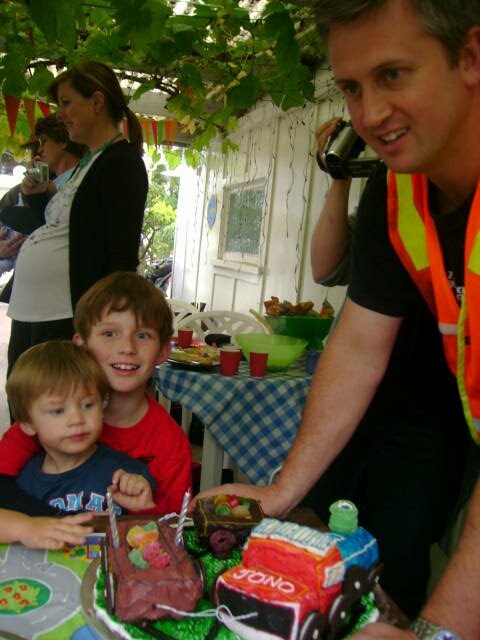 We quickly brought out the cake at 4.20 when it became obvious that the little people were getting tired and ready for home. An hour and a half is a lot of fun when you're only small. Especially at our parties!! 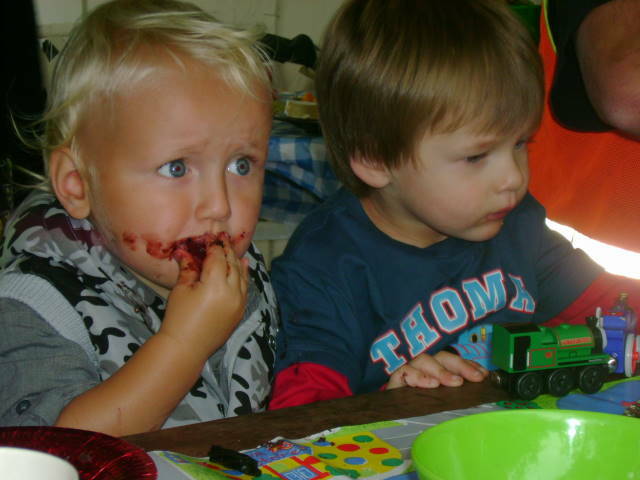 A Big Happy Birthday to Scrag and his buddy Ben (who shared the joint party; they're a day apart in age). Two cute and cheeky two-year-olds. Watch out world! 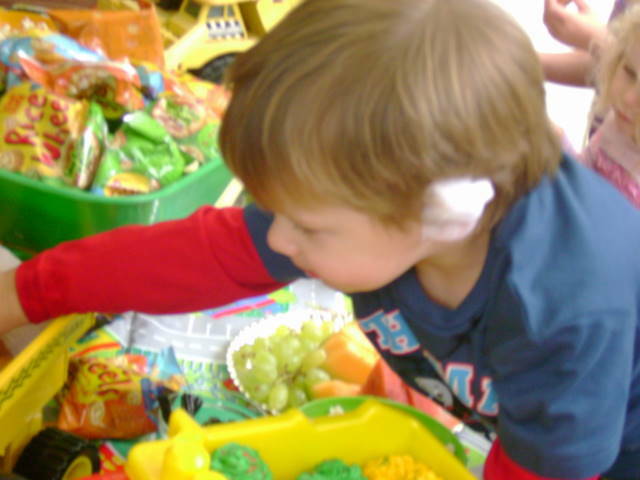 Footnote: If you're wondering why Scrag has a Vincent Van Gogh-type bandage on his ear, he had an accident today. 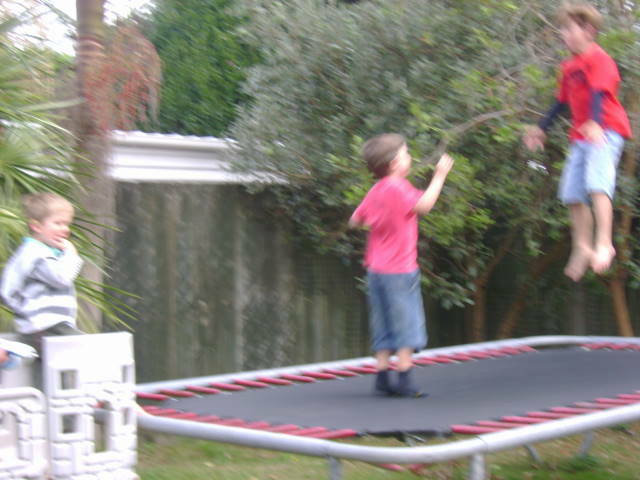 He banged his ear on the trampoline and required stitches. He's OK though, and was very brave. 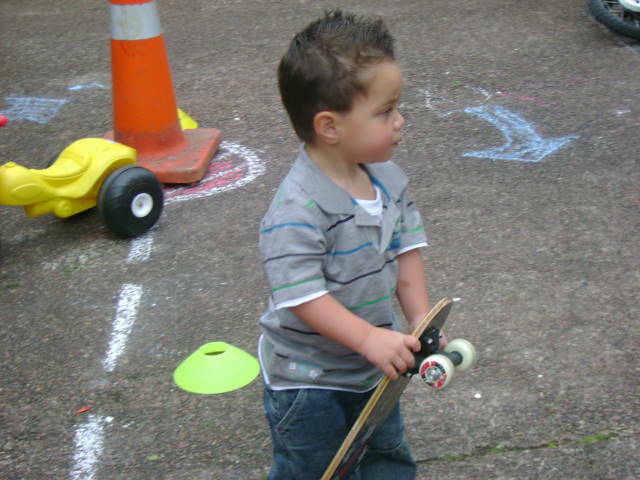 And he still had a wonderful time at his party. Wow Simone - you have organized the most amazing party! 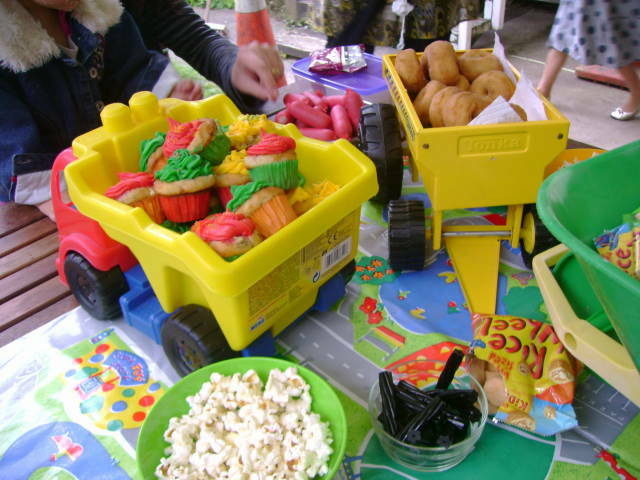 I love the food served in trucks idea and chalk drawn roads etc. Well done - cake looks fab too. 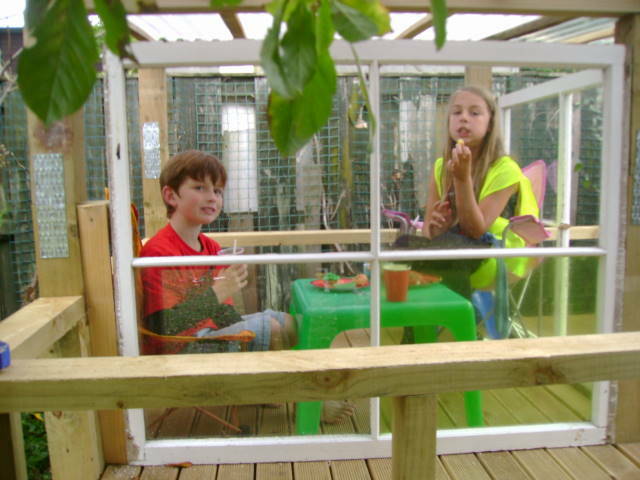 Cracking up at Dash in the tree house... looks like he's entertaining a young lady over dinner. 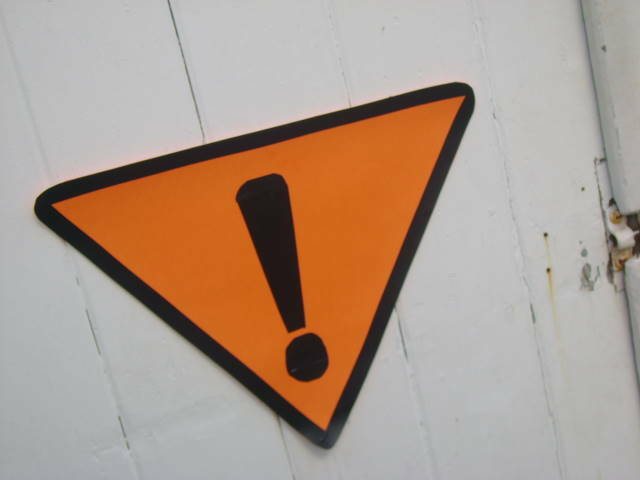 Hope Scrag's ear is okay - you guys are too cool. 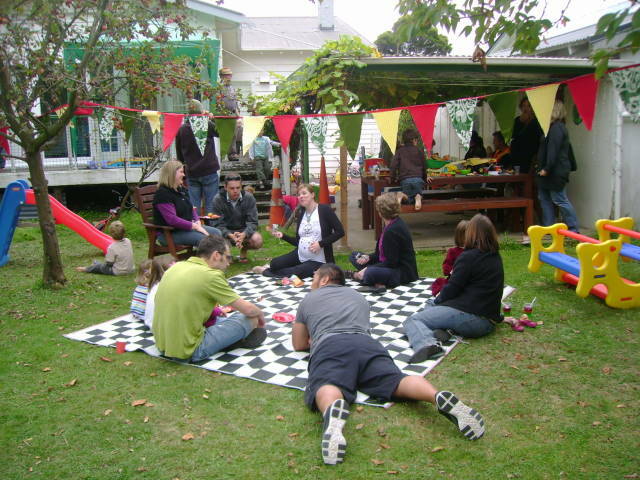 You always throw the best parties! Amazed at your creativity Simoney! 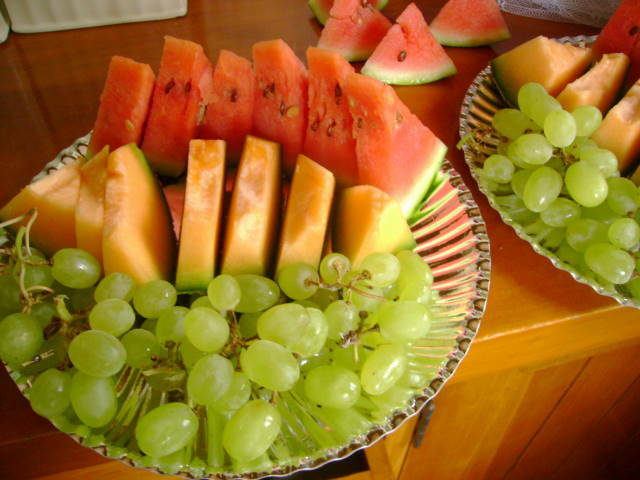 It look so wonderful! So glad it all pulled together well Simone! 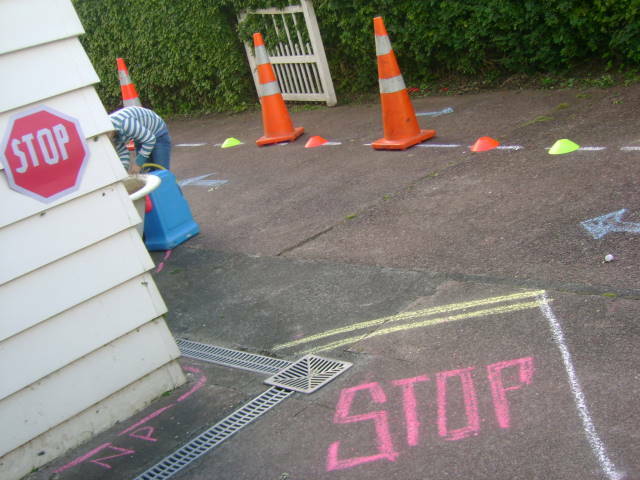 Love the drive way with all the chalk, flags and cones! And Ouchies re: the ear! 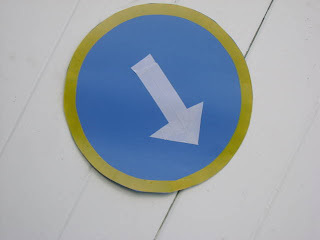 neat "roads with signs both drawn and made"
wow!! 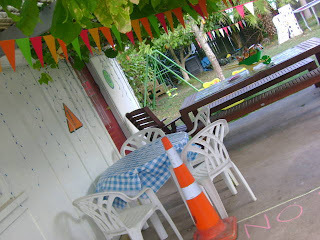 what a wonderful theme party! 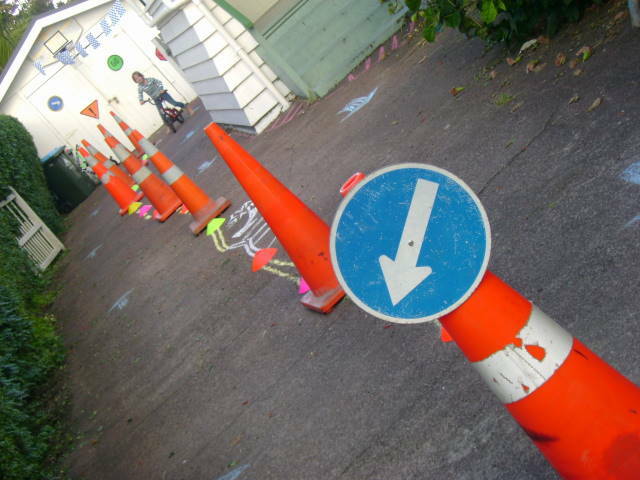 Love the traffic jellies, the cupcakes in truck, the cake, the traffic cones and signs, in other words -- everything!! I love all your ideas.. You did a great great job!! Thanks for dropping by too. Happy Saturday Sharefest! What an amazing party! You did a fantastic job - it all looks wonderful! 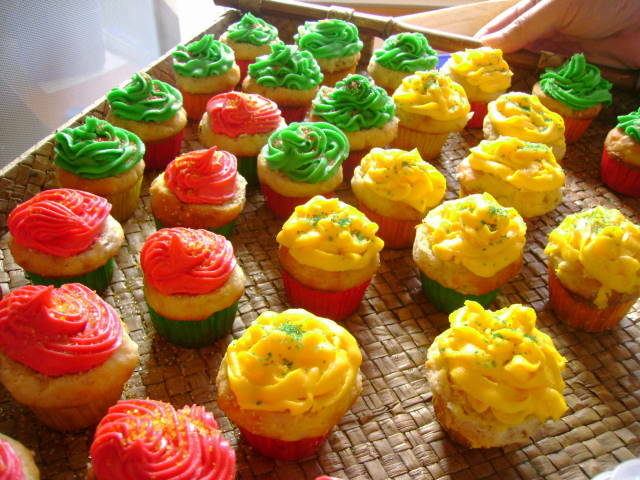 Man, want to throw me a birthday party sometime? 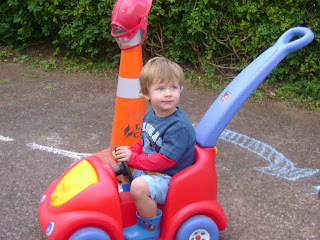 =D Happy birthday to your little guy! 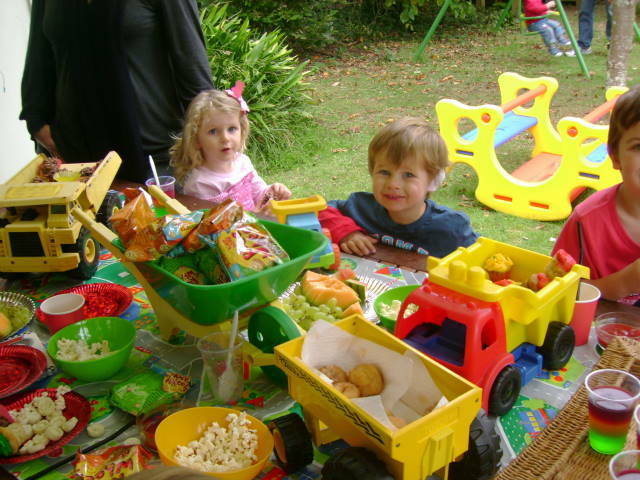 That was the best party ever! 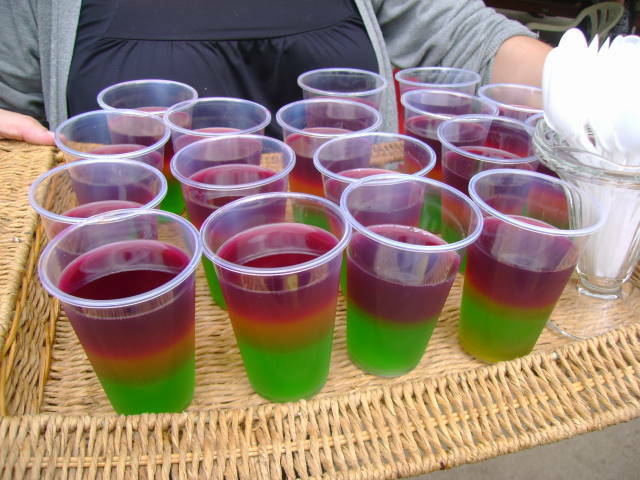 So many great idea. 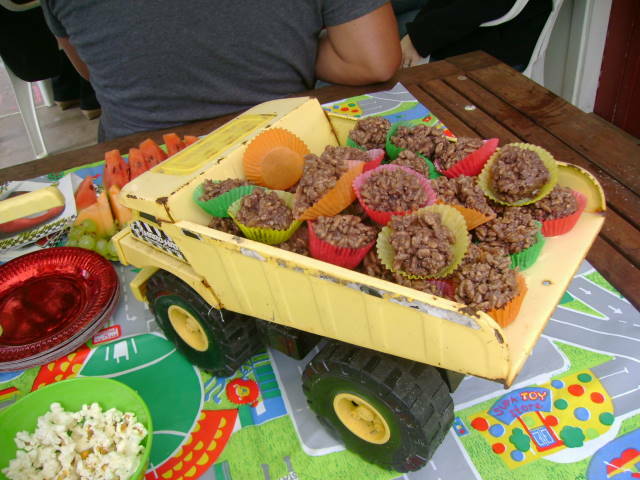 I love how the food was served in toy trucks...too cute. You really did a wonderful job. Wow, now that's a party. ouch, the ear injury sounds painful. The party sure looked fun, though! 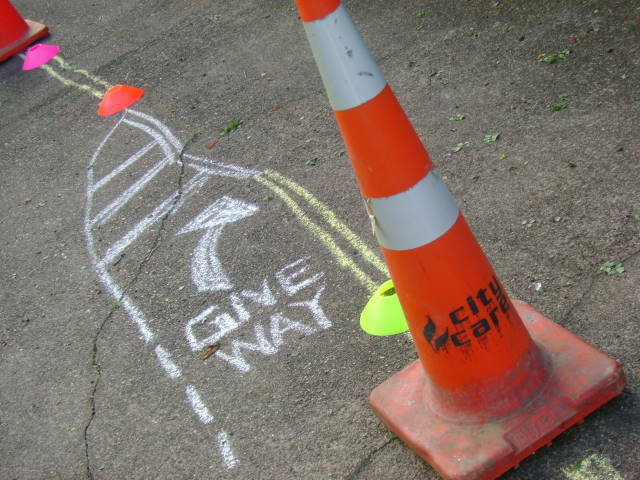 Where did you find all the traffic cones? I'd love to see more pictures of the treehouse. My husband would like to build one in the next year or two. O my goodness Simone, how amazing!!!!!!!!!!!!!!!!!!!!!! Awesome as! Found you through SITS and started looking at your parties. 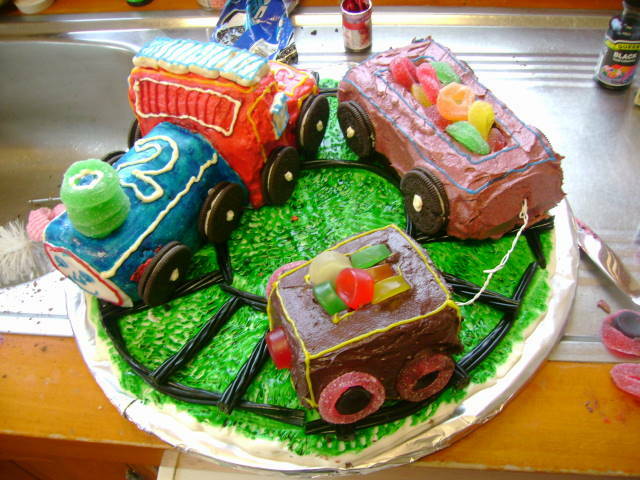 I'm planning a train party in a few weeks and this gave me tons of inspiration. Thanks so much!